Despite the pressure after the first leg defeat, Valverde went with a mixed line-up - most of the regulars and some fringe players. The late goal in the first leg did give us some comfort as we only had to win by at least two goal margin. That was not much of a problem when we have Messi in the lineup. Valverde went with Cillessen, Alba, Lenglet, Murillo, Semedo, Vidal, Rakitic, Arthur, Coutinho, Dembele and Messi. Messi played the false-9 role with Dembele and Coutinho playing on the flanks. From the start, the impetus was complete with Barcelona and Levante was simply shut down for most of the matches by our defense. Messi and Dembele was combining brilliantly in attack and most of the attack saw that combination at work. But in the first half an hour we still were training on aggregate, even though we came close in many times. But then the eventuality cannot be denied and Dembele scored twice in a short span of time. Dembele was brilliant in the build-up of the goals, but the finish had a huge factor of luck. After the restart, Barcelona kept on hunting for one more goal to make the match safe. And Messi provided that with a brilliant and cheeky finish to make it 3-0 in the second half. 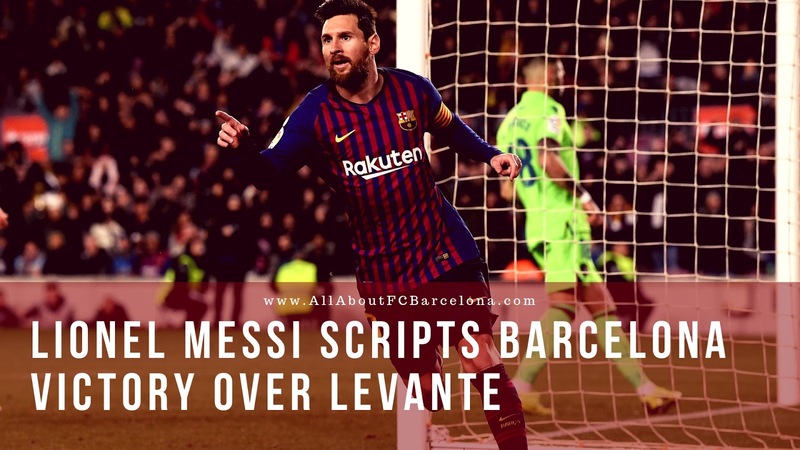 After the goal, Barcelona reduced the tempo and we kept Levante at bay for the rest of the match.